The What: The new Y-Series from d&b audiotechnik provides flexible and configurable solutions for any small to medium sized sound reinforcement requirement, whatever the application style. The What Else: While the Y7P and Y10P loudspeakers cover point source duties, with the B6-SUB providing extended frequency response, two line source loudspeakers and a matched cardioid subwoofer, the Y8, Y12 and Y-SUB tackle line array tasks. Echoing the d&b V-Series and utilizing patented three point rigging, the Y-Series is all new, yet strangely familiar. The Y7P and Y10P loudspeakers share the same dipolar 8” driver arrangement centred on a 1.4” compression driver fitted to a rotatable CD horn, facilitating deployment horizontally or vertically. With dispersion characteristics of 75° x 40° and 110° x 40° (h x v) respectively, the Y7P and Y10P offer a multitude of deployment options, individually as a full range system or in combination with other elements from the Y-Series, either ground stacked or flown. An advanced port design delivers extended LF performance down to 59 Hz. The B6-SUB compliments the Y7P and Y10P, with a single 18” driver built into a bass-reflex design, extending the frequency response down to 37 Hz. The Y8 and Y12 loudspeakers are compact, configurable, and easily recognisable as the latest members of the d&b line array family. Utilising the same rigging design as their bigger brothers from the J and V-Series, the Y8 and Y12 also share the same 80° and 120° horizontal dispersion characteristics. The Y8 and Y12 can be suspended in columns of up to 24 loudspeakers with splay angles from 0 to 14 degrees with a 1 degree resolution. The Y-SUB houses a forward facing 18” driver and a 12” driver radiating towards the rear, producing a cardioid dispersion pattern. Driven by a single amplifier channel, the compact Y-SUB can be ground stacked or flown at the top of a Y8 / Y12 array. Both the point source and line source loudspeakers feature two 8” drivers with neodymium magnets mounted in a dipolar arrangement around a 1.4” compression driver. This driver configuration enables the Y8 and Y12 to offer a horizontal dispersion pattern controlled down to 500 Hz. 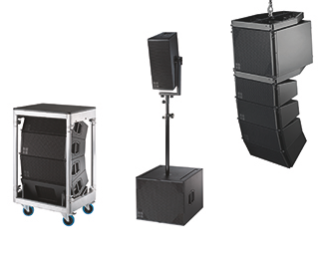 An extensive range of transport solutions and loudspeaker accessories facilitates ease of setup and mobility. Whilst the Y loudspeakers are designed to provide flexible, mobile solutions, on the other hand the Yi installation specific versions are designed for permanent applications, differing only in cabinet construction and mounting hardware. Special Colour and Weather Resistant options provide further visual integration and positioning possibilities. The Y-Series assimilates into the d&b workflow comprising the ArrayCalc simulation software, the R1 Remote control software and d&b amplifiers; a process ensuring consistent and efficient results whenever and wherever required. A multitude of line and point source loudspeakers can be combined within ArrayCalc, providing a graphical representation detailing the coverage, level drop and safety aspects of a system setup in a given space. The R1 export function transfers all configurations and settings from this simulation into an R1 Remote control project file, taking into account any system specific functions. The R1 workplace presents an intuitive format for operating systems via the d&b Remote network, either through CAN-Bus to access the D6 and D12 amplifiers, as well as the D80, which can also be controlled through Ethernet using OCA protocols.